Dubai and shopping are synonymous; as there is nothing that you can resist buying here, whether it is gold or electronics. Although, whole emirate is eminent for the variety of electronic gadgets, deals and prices that it provides; yet Dubai has got that x-factor being a tax-free state. If you are a resident, visitor or a locale in Dubai; then you are blessed to be at a place that offers you the best electronics items and deals at the best prices; that you may not get in any other corner of the world. Dubai electronics shopping is not only famous among the locals but also the tourists, as there are an array of options for them at the best possible price. Dubai is an urbanized arena of electronic malls and shops. So, if you are an electro-freak and luckily in Dubai these days; or if you are planning to visit it in the near future; then you must visit these splendid electronic shops in Dubai, recommended for electronics shopping. Because they have too much to inspire you, with their unbelievable offers and astound display of technological advancements in the electronic world. So, while wandering around Dubai, don’t forget to trace the one nearest you, to grab your favorite electronic goodies! Below are the electronic stores & shops, recommended for the Dubai electronics shopping. Al-Fahidi Street is occupied with copious electronic shops that offers cheaper electronics. If you are seeking to buy laptops, computers, cameras, washing machines, refrigerators, ovens, kitchen appliances or general electronic gadgets for personal use; then Al-Fahidi Street is the right place to go to. You may find your favorite items here at the best market prices with international warranty. However, while taking them along with you; all you need to do is to check the voltage requirements mentioned over the packaging; in order to ensure that it matches the voltage supply of your usage spot. You will find Al-Fahidi street in Bur Dubai, which is one of the famous spots in the downtown Dubai for electronics shopping. ECity is one of the most successful multi-brand electronics store chain spread over premium shopping places across Dubai. ECity offers you multi-product, multi-brand and multi-service retail options; if you opt to buy electronic products from Dubai. It represents a wide range of over 100 electronic brands under one roof, including computers, laptops, gaming items, cameras, consumer electronics, general electronic items, smartphones home appliances and electronic accessories. ECity is also privileged to be the first technological convenience retail of the region and allow to choose from an absolute massive electronic product range in Dubai. Some of the biggest ECity stores are located in Dubai mall, Midrif City Centre, Wahda Mall and Metro Link- Mall of Emirates that open every day between 10.00 am –11.00 pm. For more information, you can visit their FB page here. You can also now buy electronics item online in Dubai and have them delivered to your address. From VCD Players to Stereo Systems & Camcorders, you can buy range of high-tech electronics gadgets online in Dubai. We have hand-picked some of the best deals for your below. 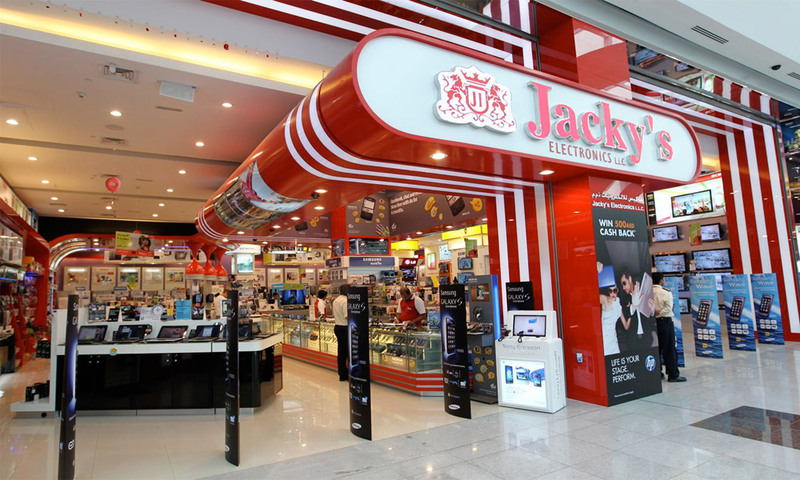 Jacky’s Electronic is an international electronic chain in Dubai, that offers a wide range of electronic offerings. Jacky’s Electronic is a retail giant that primarily offers you a great deal to choose from the most advanced lot of televisions, media players, music systems, dish & accessories, satellite receivers, telecom products, smartphones computers, laptops, gaming, home appliances, portable electronics, cameras and photographic accessories. The store also offers extended product warranties, protection plans and gift vouchers. Jacky’s Electronic Stores are located in Ajman City Centre, Nasser Square and Dubai Mall that’s open every day between 09.00 am –11.00 pm. For more information, you can visit their FB page here. Plug-Ins Electronix is another leading electronic and IT retailer in Dubai, that offers an extensive variety of consumer electronics. It represents over 350 electronic brands and is a true powerhouse of electronics. Buying electronics from Plug-Ins could be an enjoyable experience for you; as it offers excellent product services, wide product range, well-informed store representatives and excellent customer services that make your shopping experience memorable. The plug-ins store is located in The Dubai Mall that remains operative between 10.00 am –11.00 pm every day. For more information, you can visit their FB page here. Jumbo Electronics is an absolute gem heart for electronic freaks and is one of the largest electronic selling companies in UAE. Jumbo Electronics is deeply indulged in providing electronic products of all the leading brands including Smart Phones, LED Televisions, Headphones, Vacuum Cleaners, Laptops, Tablets, Gaming Consoles, Fitness Devices, and Home Theatres. At Jumbo Electronics you can also find super-saving combos that suits exactly to your needs at the most affordable prices. Jumbo Electronics is at your service in Burjuman Centre, Dubai every day except between 9am to 11.00 pm every day. For more information, you can check out their FB page here. Sharaf DG is another leading electronic powerhouse of the region. Sharaf DG offers computers, cameras, phones, home appliances, gaming and wearable technological accessories. Sharaf DG has 15 stores in Dubai located at Union Metro Station Deira, City Center Mall- Bur Dubai, China Court, West Court, Times Square Centre, Dubai Mall, Bur Dubai etc. Sharaf DG offers services every day between 9am until 11.00 pm. These are some of the stores & shops, recommended for Dubai electronics shopping. If you want to recommend an electronic store or shop, please do so by adding comments below. You can also checkout this article to find out stores to buy electronics online in Dubai. Hi this is Frank. Sales representative of a an Audio Visual manufacturing company in China, called Wellsound Audio Visual Co., Ltd. We manufacture DVD players, waterproof portable bluetooth speakers, home theater systems and sound bars. very attractive designs and high quality hot selling products. please email / skype me at : sales8@dgwellsound.com so we can cooperate to market our products in your area. I live in Shenzhen, China. I can provide you best quality electronics at good price. I speak English, Chinese and Urdu/Hindi. If you have any requirement, feel free to let me know.